As youth ministers, we know you have many questions about what an overnight trip entails, and if it could serve your ministry. Summer Servants has been housed by DeWitt Community Church in DeWitt, NY. There will be separate sleeping arrangements, bathrooms and showers for males and females. How will my group get there and be transported? You are responsible for your own transportation to Summer Servants and to the work sites during the program. You should drive in cars or vans that fit everyone in your group. Summer Servants will be doing a variety of work, such as working with children from low-income housing, working on urban farms and community gardens, helping at summer programs such as vacation Bible school, serving the hungry, creating community art, working with the elderly, and completing minor home repairs. Specific work sites will be known before you arrive, so you will know how to pack appropriately. What will we do when not involved in service? At our home site, there will be a variety of things to do during free time. There is a rec room, with games available to the group. Outside there is green space for outdoor games and sports. Structured group times are scheduled for every morning, afternoon, and evening, which are designed so that the group can learn and grow as a community. Will our teens be safe? Summer Servants does everything in its power to keep kids safe during the week. Teens will never be without an adult leader, and will never be put in known danger. We work with established organizations who are used to welcoming volunteers, or with families who are in the Brady network. Safety is our first priority. Why do I have to bring adult leaders? 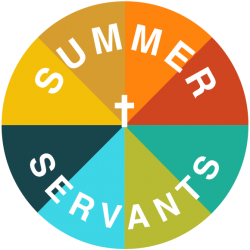 The success of Summer Servants is dependent on the leadership of adults from registered churches/schools, who are actively involved with their youth. These adults will work beside the teens and lead them through the week. Then, after Summer Servants is over, these adults will be able to follow up with the teens, and integrate what they’ve learned into their daily lives. You must have both male and female adult leaders if you bring both male and female teens. Bring a minimum ratio of 1:8 and a max of 1:4. To whom are payments made out to?